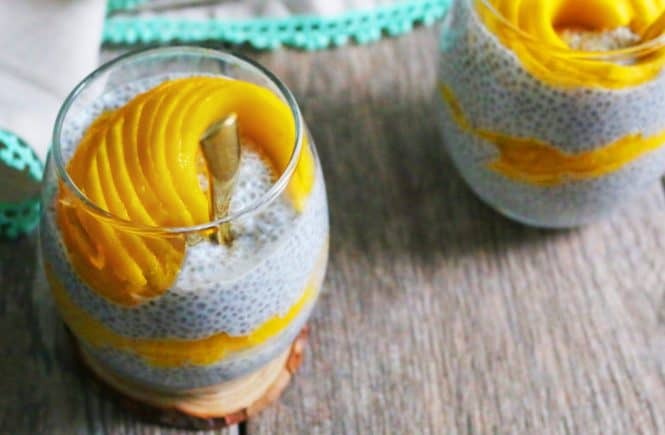 The simplest of recipes. It’s so easy, its ridiculous. 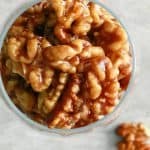 This candied walnuts recipe is perfect for your cheese board or over ice cream / pancakes / waffles or with popcorn or over salads or crostini (like these Persimmon, Goat Cheese and Walnut Crostini or just a snack (the best!!!). Endless possibilities and SO ADDICTIVE. 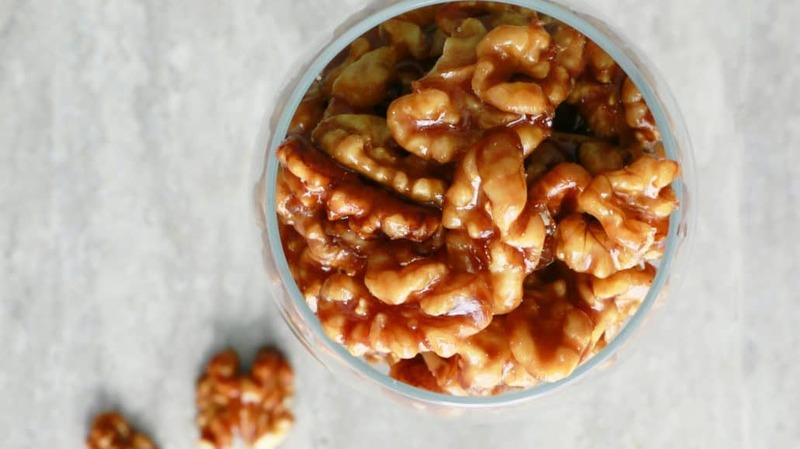 How to make candied walnuts ? 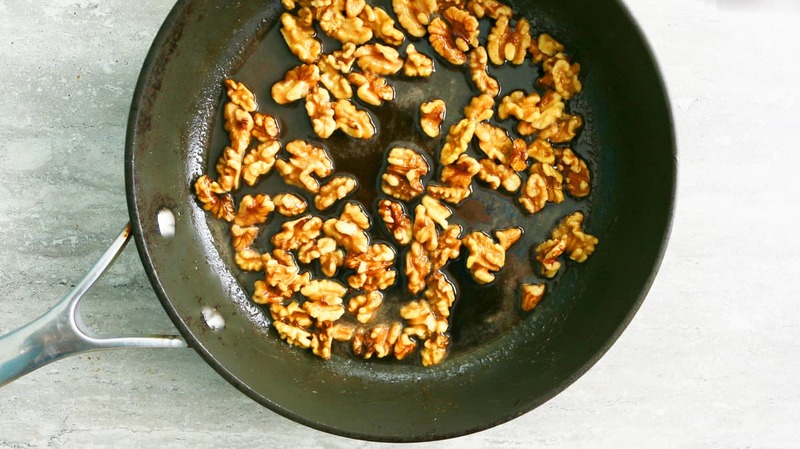 Cook walnuts, brown sugar, water, butter and salt in a non-stick pan, until all moisture evaporates. Transfer to a parchment paper and sprinkle more salt on top (you as much or as little you like). 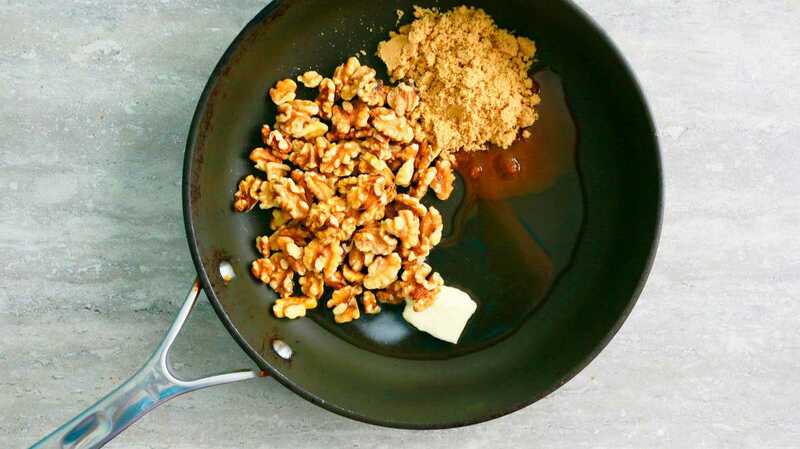 The ingredients <— Walnuts, brown sugar, water, butter and salt. Salt and Pepper Cashews – Crispy, crunchy, spicy ….ADDICTIVE! 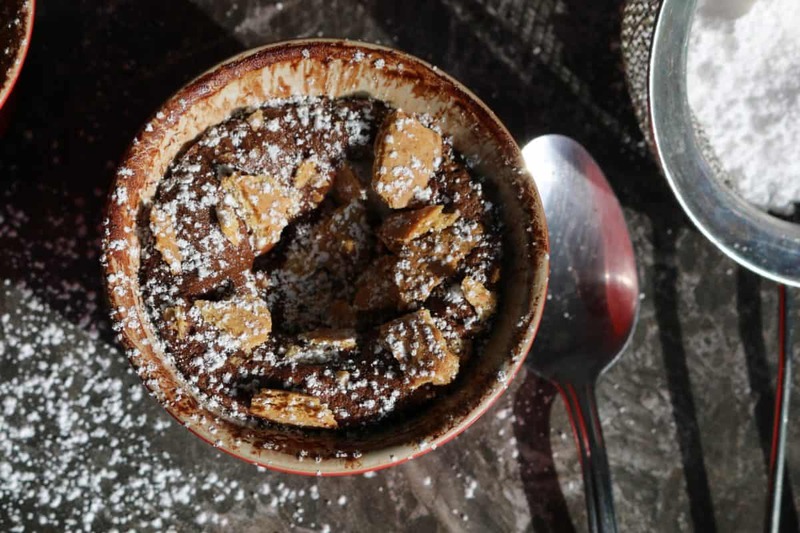 After 1 minute of cooking over high heat, the sugar melts and gets liquidy. At the end of 5 minutes, all moisture evaporates and it gets almost dry. Dump onto a parchment paper (scrape off off the yummy goodness sticking to the pan), spread evenly, sprinkle sea salt and cool completely. 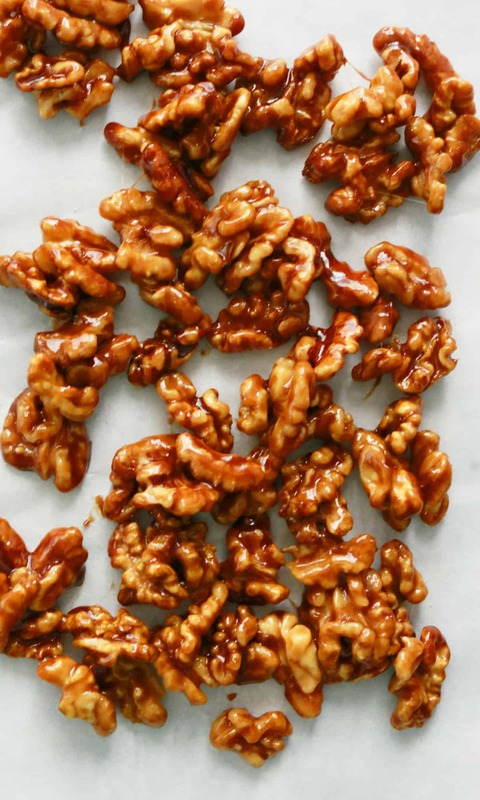 How to package candied nuts? Wrap them in clear cellophane. Tie a pretty ribbon and you’ve got yourself a delicious (and easy) homemade holiday favor! Top your holiday french toasts, pancakes, waffles,…..
Or in this Bagels with Buttered Cream Cheese and Candied Walnuts meal prep for breakfast / school lunch box. 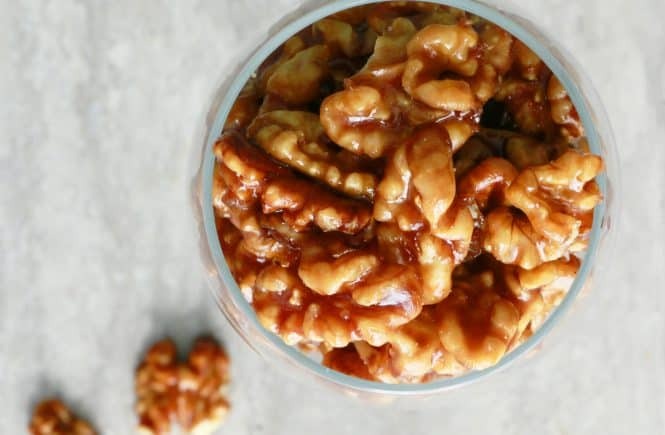 Easy candied walnuts that takes 5 minutes and has 5 ingredients. 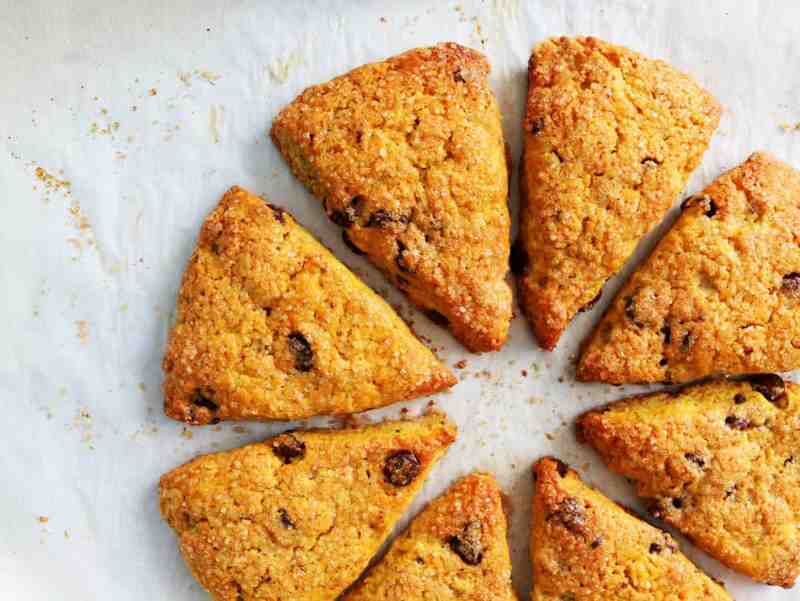 They are chewy, crisp, salty and not-too-sweet and tastes divine!!! Place a piece of parchment on a dinner plate (approximately the size of the plate) or any other heat proof plate. Set aside. Place all ingredients (except one pinch salt) in a medium non-stick skillet. 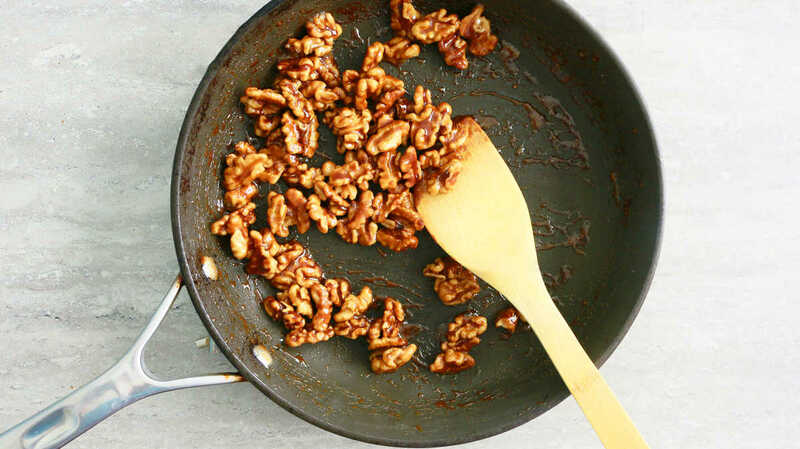 Place skillet over high heat and cook (stirring occasionally) for 5 minutes (stirring constantly in the last minute), until all moisture evaporates and the nuts get darker, glossy and begins to clump together (refer pictures). 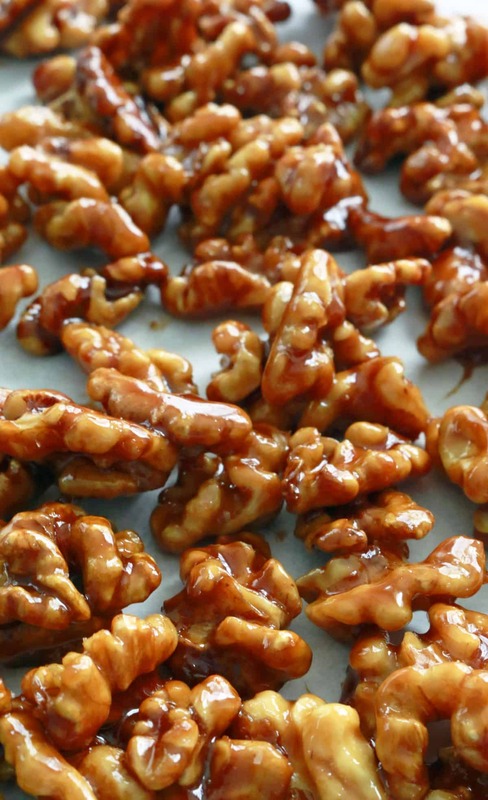 Immediately transfer nuts (scraping any remaining caramel off the pan) on the prepared parchment. 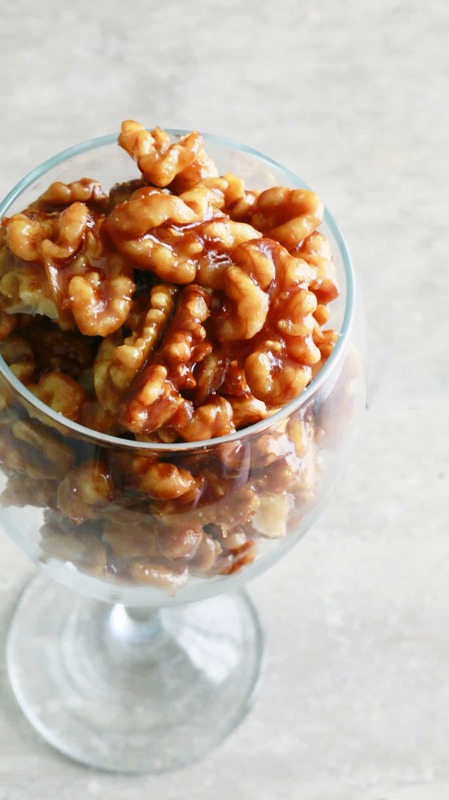 Spread the nuts, so that they are in a single layer and sprinkle one pinch salt evenly on top of nuts. Let cool to room temperature and break apart with your fingers. 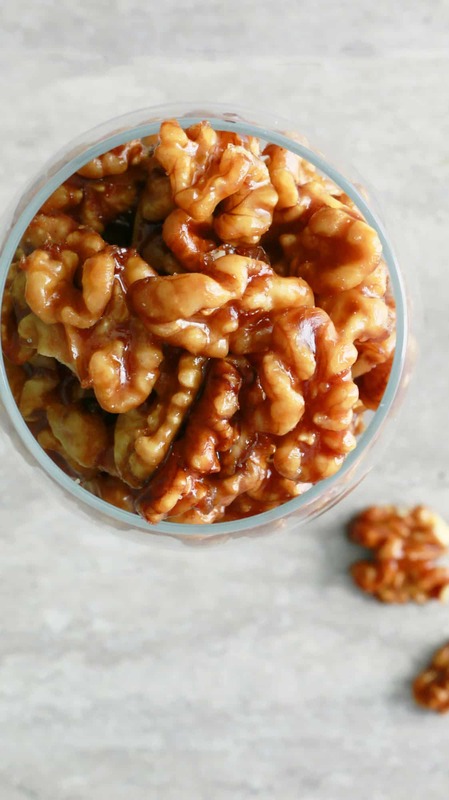 Store nuts in a container for several days <– if it lasts that long. Non stick pan is a must. You could use a small non-stick skillet, cooking time might take an additional 30-45 seconds. I know right, God knows (or my scale😀) how much of these I’ve eaten these last few days. Thank you so much Kathy. I looooove candied nuts! These look just perfect! Just made three batches for Christmas gifts. Outrageously simple to make, but they taste so good everyone will think I slaved in the kitchen with a candy thermometer. Thank you, Maria, for what is sure to become a holiday tradition for me!